Zebra ZT220 printer is Zebra's most affordable table-top printer, having a maximum print width of 104mm and a maximum print speed of 152mm per second. The Zebra ZT220 industrial printer has a high impact polymer case and simple single-use three button interface for simpler applications. 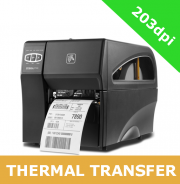 Zebra ZT220 barcode label printer is Zebra's most affordable industrial printer and has a durable high-impact polymer case with simple three button user interface. It is ideally suited for barcode labelling applications with infrequent label changes. The Zebra ZT220 is available in both 203dpi and 300dpi resolutions and has a choice of either USB and serial interfaces or ZebraNet 10/100 PrintServer for network connectivity. The Zebra ZT220 has a maximum ribbon capacity of 300 metres.